End-User Development (EUD) is an emerging research area aiming at empowering non-technical users to somehow create or design software artifacts. Mashups provide a high potential for EUD activities on the Web. Users on the Web can tap into a vast resource of off-the-shelf components in order to rapidly compose new lightweight software applications called mashups. 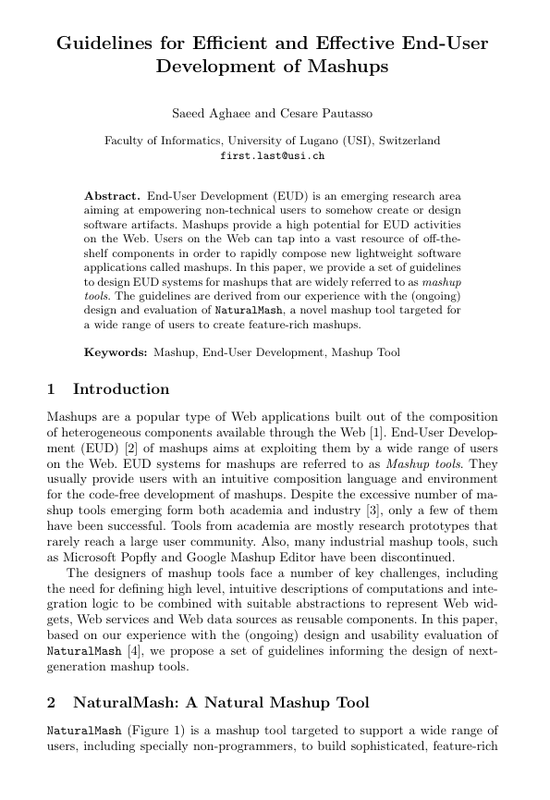 In this paper, we provide a set of guidelines to design EUD systems for mashups that are widely referred to as mashup tools. The guidelines are derived from our experience with the (ongoing) design and evaluation of NaturalMash, a novel mashup tool targeted for a wide range of users to create feature-rich mashups.